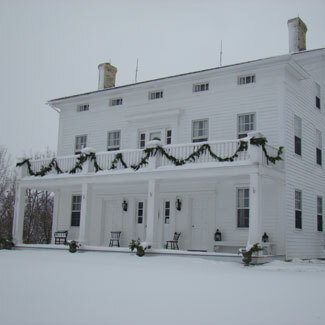 Eagle Centre House is a replica of the 1846 stagecoach inn, “Delafield House” presently known as “Hawk’s Inn,” a privately held museum operated by volunteer staff and located in Delafield, WI, about 16 miles north of Eagle. It is Greek Revival in architectural style, a style which was popular up through the Civil War. The proprietors, Riene Wells (Herriges) and Dean Herriges and their families constructed the recreated building. A Master Carpenter, Dean worked from exterior plans and photographs of Hawk’s Inn. 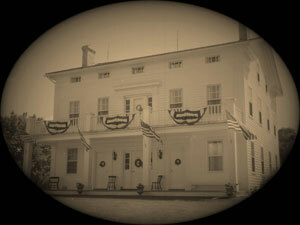 Construction began in October 1989 and the Bed & Breakfast opened in October 1990. Eagle Centre House is home to Dean & Riene, just as the Hawks family made their home at the original inn. 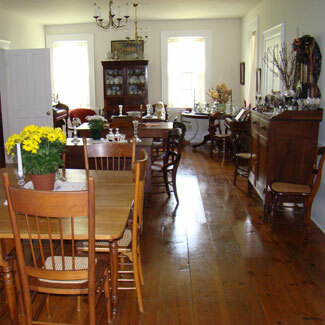 A Bed & Breakfast in the true sense, and in Wisconsin, by law, must be a primary residence. It is not a commercial establishment. At Eagle Centre House we’ve done our best to adhere to the romance of the past, from our name to the design of our sign. A place of lodging was known as a “House” and most often given the village name. Our sign design is copied from one in an area museum. About 12 of the 20 acres are a remnant of a prairie oak opening and are in conservancy. In spring you’ll find pasque flowers, the endangered kitten tail plant and many other prairie grasses and flowers. We hope you enjoy your journey to the past today! "I love just sitting in the rooms and getting the feel of the mid-1800 time period."